November 17th, 2015. 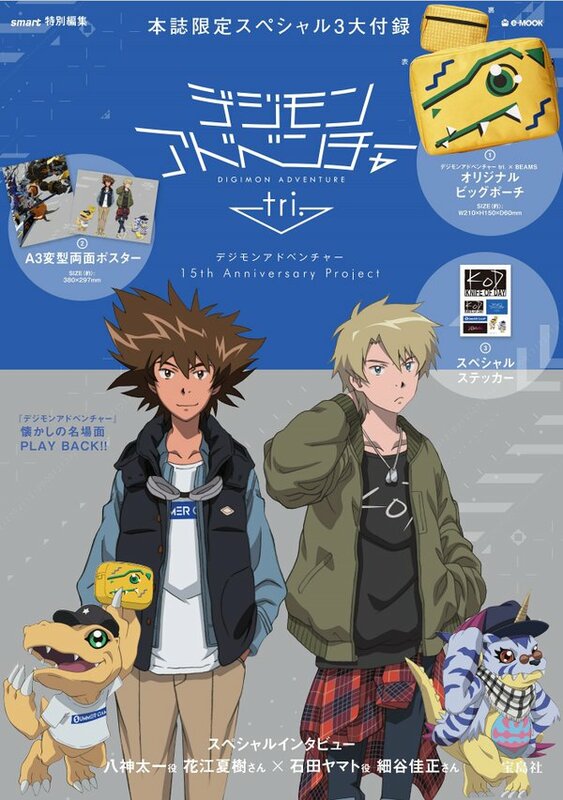 Japanese distributor Elpaka Books announced over Twitter an upcoming special editorial of the e-mook series smart [sic], focusing on Digimon Adventure tri. Contrary to their name, e-mooks are not electronic but are instead "enhanced magazine-books," a recent form of Japanese publishing which come packaged with special gift items that drive up the price of the issue, enticing consumers to buy the mook for the item. This special editorial will contain a large Agumon pouch ("Original Big Pouch") from clothing brand BEAMS, an A3-size poster for Digimon Adventure tri., and a sheet of stickers featuring Ishida Yamato's new band "Knife of Day." The issue will become available on November 20th, one day before the first tri. film's Japanese premiere. It will feature a special interview with the new voices of Yagami Taichi and Ishida Yamato, Hanae Natsuki and Hosoya Yoshimasa, and will retail for 2000 yen, approximately $20 in US money. Earlier today the blog Digi-Egg mistakenly reported Elpaka's magazine-book cover as a poster for new charms, misconstruing the word 魅力 miryoku "fascination/charming" to mean a charm item. Elpaka Books is a subsidiary book distribution service of Lawson, a Japanese chain of convenience stores. Originally prominent for its e-book distribution, Elpaka shut down their e-book service in 2014 and has since focused on print.